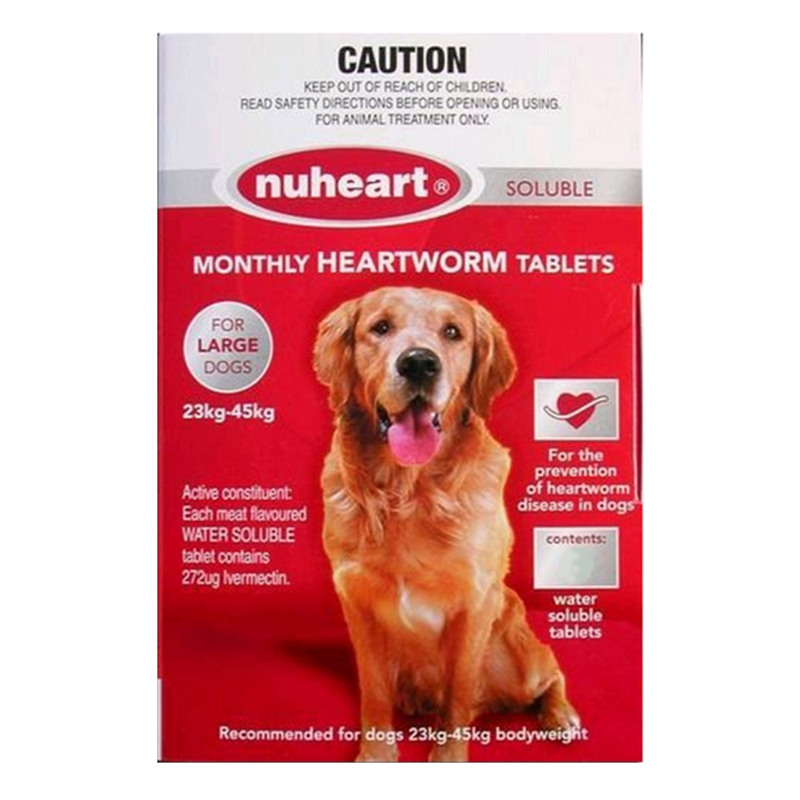 Nuheart is a generic heartgard alternative for the prevention of heartworms in canines. This monthly treatment has the same effectiveness due to the same ingredient at the same dose rate as the Heartgard brand. The meat-flavoured tablets are easily accepted by dogs. 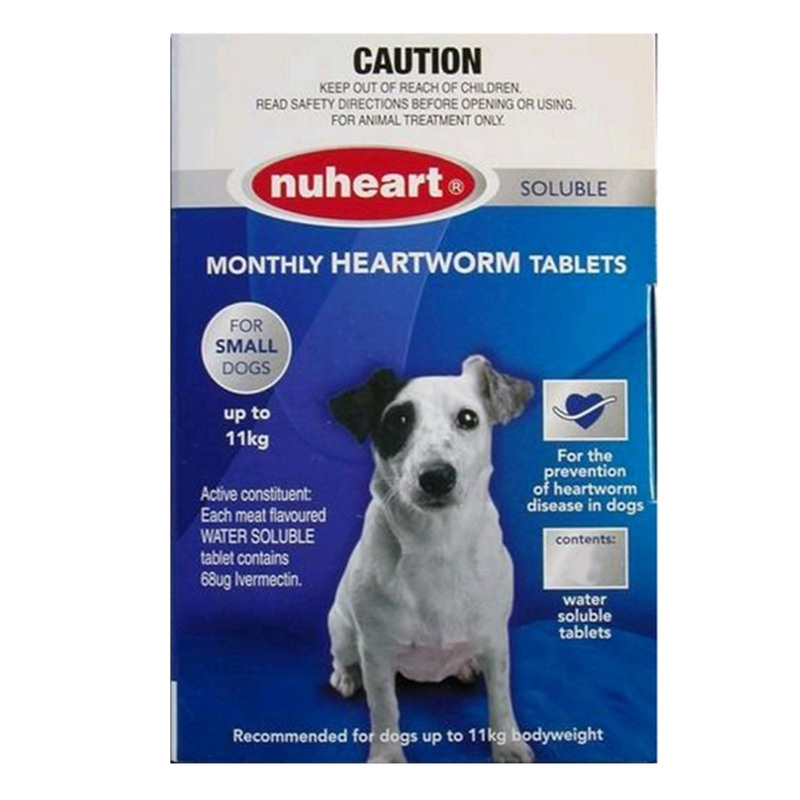 By eliminating heartworm larvae from dogs, Nuheart protects dogs from the dangerous heartworm disease. Nuheart contains the same ingredient Ivermectin as Heartgard. It is effective in preventing heartworms larvae to fully develop into adult heartworms. The ingredient eliminates the heartworm larvae that infect the dog during the previous month. Thus, Nuheart heartworm tablets prevent heartworm disease caused by the parasitic worm Dirofilaria Immitis in dogs. Dogs should be tested for heartworms before starting the treatment. Weigh your dog first, and then start the treatment. For difficult dogs, dissolve in a small amount of water and add to dog food. Ensure all food is consumed by your pet. 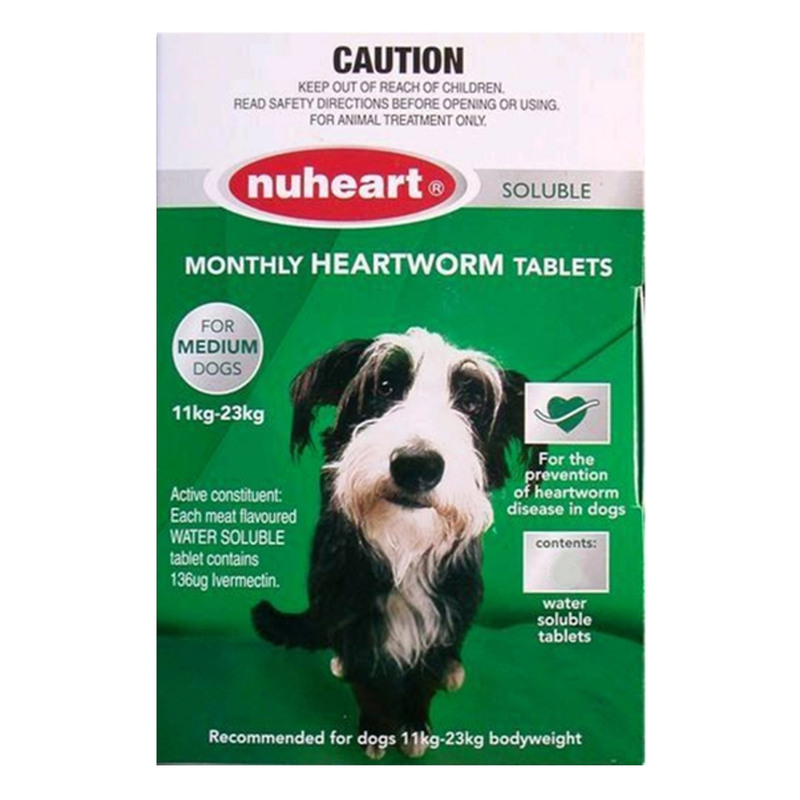 Nuheart is highly effective for the prevention of heartworm disease in dogs. It contains the same ingredient as in Heartgard and each tablet contains exactly the same amount of ingredient. The meat-flavoured base makes it easy to administer in dogs. For fussy dogs, Nuheart tabs can be easily dissolved in small amount of water and mixed in pet’s food. It is an affordable treatment with the same effectiveness of costly heartworm prevention treatment. Safe for puppies as young as 6 weeks of age. Nuheart has wide range of safety in all breeds and sizes of dogs. If your dog is not currently on heartworm prevention, it is important to consult with a vet before starting Nuheart treatment. The side effects of Ivermectin are rare at the recommended dosage. It works just the same as Heartgard but is available at much cheaper prices. I always recommend this product to my friends who are pet parents. My dog has never had any problem ever since we have started giving these tablets to him. He cleared his last physical test as well. So far so good .It eliminates heartworms at a very good rate. I have been using this product for a few years and its the cheapest and most efficient prevention to ensure my dog is protected from heartworm. Plus the price here is unbeatable. I have been using this Nuheart for six months and I find it to be most cost effective way to protect my dog from heartworms.